At this point, the Peopoly Moai almost needs no introduction. Cliffnotin’ it; affordable kit SLA that’s easy to put together, easier to use and outputs prints as good as machines multiples its price. Since launching in 2017 as a surprise resin-printing hit, the Moai has cemented its status as the alternative SLA system for researchers, jewelers, modelmakers and generally those looking to get acquainted with the intricacies of SLA without skimping too much on the hardware. And the Moai’s creator, Shu ‘Mark’ Peng certainly has been busy in the time between then and now, releasing hardware upgrades such as an FEP vat, chamber heating unit, multiple resins, and even developing a feature-rich slicer specifically for SLA 3D printing. All this, alongside the secretive Project DFA, a tantalizing glimpse of desktop large-format SLA prints which has now surfaced as the Peopoly Moai 200. Unveiled in 2018 and available now, the Moai 200 tempers the DFA’s 300 mm-cubed print volume for 200 mm-cubed, and brings with it a whole host of new goodies on top of the original Moai’s form. Read on as we take a closer look at the deets. On the outside, you’d be hard pushed to spot the difference between the original Peopoly Moai and the Peopoly Moai 200. Cutting an identical glossy black figure, these machines both look like shiny monoliths from the future. 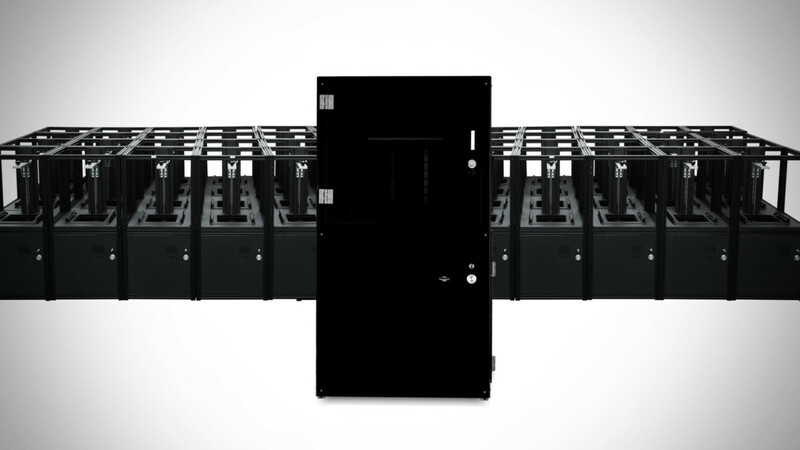 Peek past the opaque (and lockable) UV blocking door, and you’ll see the stark differences between the Moai and the Moai 200. For starters, the original Moai’s 130 x 130 x 180 mm print volume has grown to a generous 200 x 200 x 250 mm. To put this into perspective, Formlabs’ Form 2 features a print volume of 145 x 145 x 175 mm. 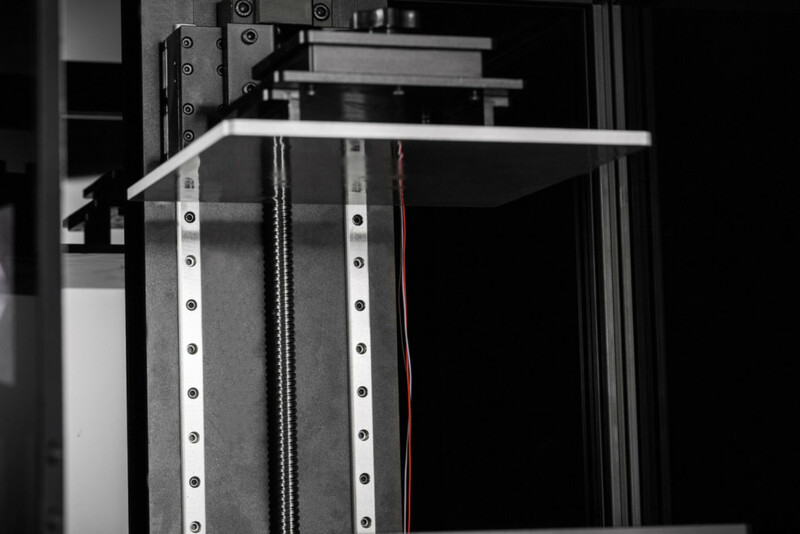 Likewise, the Phrozen Shuffle XL LCD-based 3D printer (which we recently reviewed) has a volume of 190 x 200 x 200 mm. That’s a heck of a build space for printing with resin. To achieve such large prints without compromising its means of printing, the Moai 200 features a newly designed perforated print plate. Said to reduce the peel force and improve adhesion, this large slab of holey metal is the next most noticeable difference between the Moai and Moai 200. As is the addition of the original Moai’s add-on extras (all developed and released over the year following the Moai’s release) as standard. Indeed the Moai 200 uses an FEP film vat, meaning a tough metal vat lined with taut FEP film as its interface layer. This, in turn, leads to a more forgiving peel force on layer change when compared to the original Moai’s rubbery PDMS layer. An extra benefit comes in the FEP film being longer lasting and less susceptible to wear and tear, too. 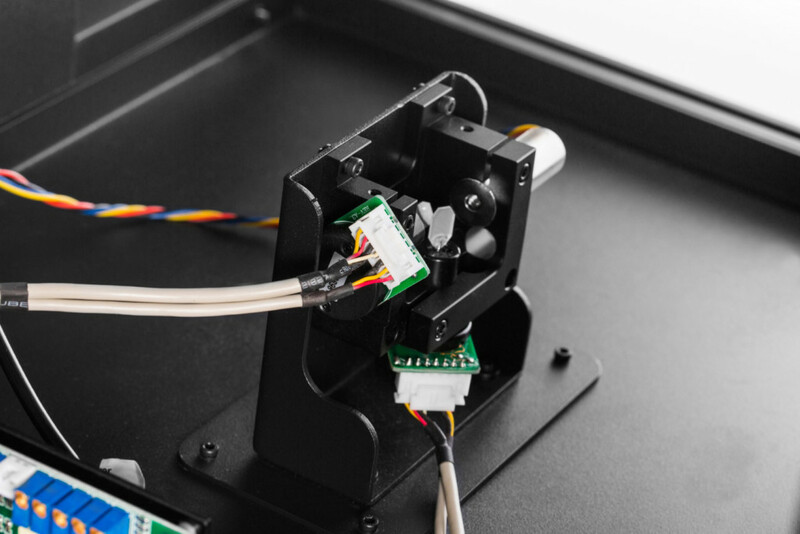 Looking to the rear of the print chamber, the Moai 200 uses dual linear rails for stability in guiding the Z-axis movement — a necessary upgrade given the potential weight of the print plate and forces exerted on the large prints. Surprisingly for a 3D printing method that features no heating element, a key factor in resin print success is temperature. To bring this under the user’s control, the Peopoly Moai 200 also features a temperature control system. 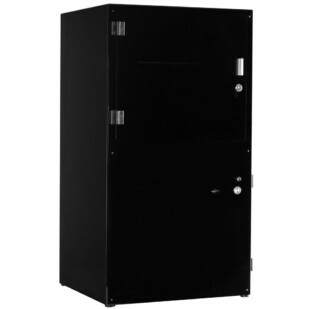 Nestled inside the print chamber this heating unit will, at the very least, eliminate improper temperature from your checklist when troubleshooting print failures. A video teasing the new printer also mentions the inclusion of a UV LED lamp for print curing. At the time of writing, we have no further details on this and how it will work. The Moai 200 doesn’t appear to have inherited the easy-level print plate system introduced as an extra for the original Moai which, if so, will mean opening up the side of the machine (now via a second, also lockable, door) to access the “bed” leveling screws. Besides the above, everything else about the Moai remains as we know and like. A laser running in the 405 nm wavelength, with a spot size of 70 microns, and fully accessible via native controls on the printer itself returns. This translates to wide resin compatibility, with the vast majority of 405 nm resins printable in the Moai 200 — including, with some tinkering in the settings, resins designed for LCD-based printers. The release of the Moai 200 is markedly different from the original Moai, in that Peopoly now has Asura, a Moai specific software to take users through the entire print preparation workflow. This was a criticism of ours with the original Moai, which as a kit SLA printer brought unreal accessibility and flexibility for relatively little money. Software and post-processing support were the two main weaknesses, and this is a huge patch over one. Available fully assembled, you’ll be able to pick one up from the Peopoly website from $2,799. Quite the leap from the Moai’s current tag of $1,295. You could reason that across the board hardware improvements, and development costs justify the price jump. 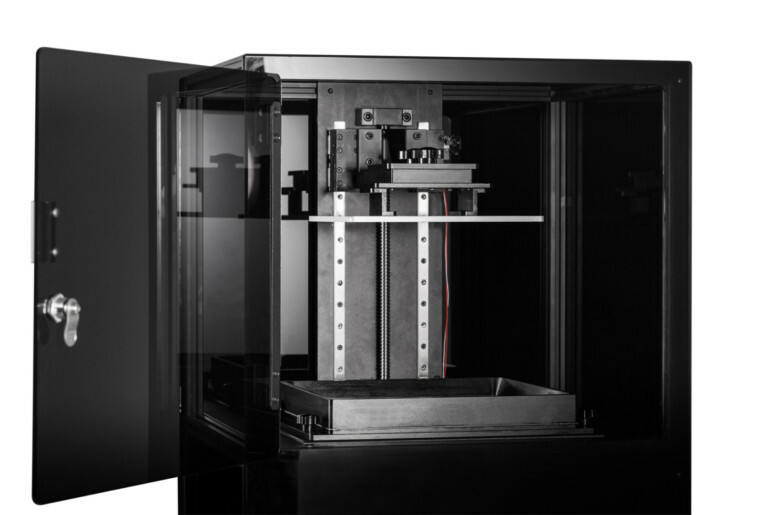 Certainly, held against professional desktop FDM solutions and the market-leading Form 2 when balancing cost against print volume, the Moai 200 continues Peopoly’s trend of offering (comparatively) affordable SLA 3D printers. We’ve heard that the printer should be available early February. We look forward to trying it out and giving our full verdict in the not too distant future. The Peopoly Moai 200 should be available sometime early February via the Peopoly website and retailers listed below. 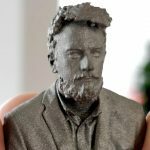 License: The text of "2019 Peopoly Moai 200 3D Printer – Review the Specs" by All3DP is licensed under a Creative Commons Attribution 4.0 International License.